Adding wood siding will dramatically improve the look our your old house. Depending on the type of wood and finish you choose, you should expect to get 25 years or more of service from adding wood siding. While it takes time to get the first course started, you can cover a large are in a short period of time. Observe power tool safety, eye and ear protection. Do not nail within 1" along the direction of the grain to avoid splitting. Prefinish the siding before installing. 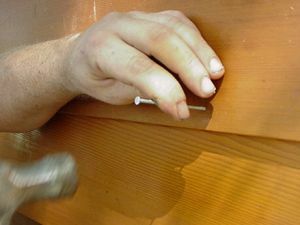 Check and nail any loose old siding. The new siding begins with the bottom course and must be planned for the entire house. Using a line level and chalk line, snap a line around the entire perimeter around eye level Measure down to identify the variations in the edge of of the existing siding. Select through the stock for even wood tone. Look out for splits and uneven end cuts. Mark the "bad" sections and use this for shorter pieces between windows and doors. Transfer the measurement between the the perimeter trim boards to the siding. Try to keep cuts to within 1/16" accuracy. On a warm day, the board should just fit, whereas on a cold day, undersize the siding by 1/8" allow for 1/16" expansion on each end. The cedar used here is about 8" wide with a nominal 6" reveal. Most power miter boxes are not large enough so you will need to mark a cut line using a speed square.